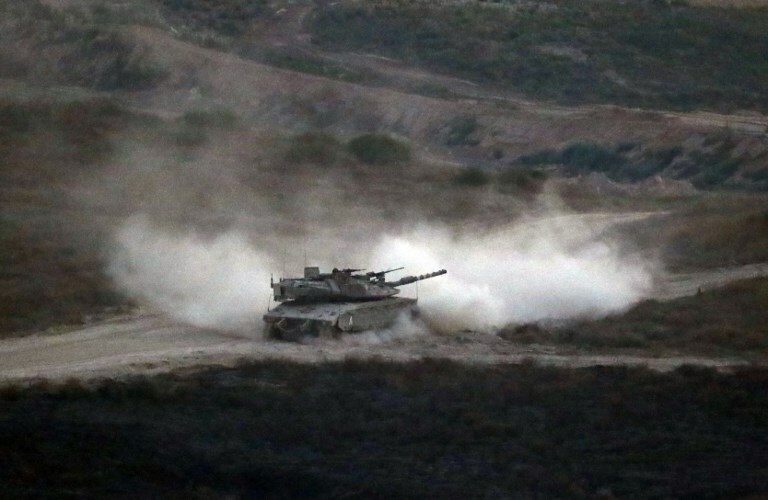 An Israel Defense Forces tank on Thursday shelled a Hamas post in the northern Gaza Strip after Palestinian gunmen fired on an Israeli military position along the border fence, the army said. No Israeli soldiers were injured by the gunfire, the military said. Hebrew-language media said the target was an IDF pillbox, which is a concrete structure that offers protection against rifle fire. It wasn’t immediately clear whether there were casualties in the Israeli strike. Prime Minister Benjamin Netanyahu visited the Israel-Egypt border on Thursday afternoon and was briefed on the Gaza security situation. In a statement following the visit, Netanyahu, who also serves as defense minister, said he was “aware that in the last few days Hamas’s aggression is renewing in all sorts of forms,” threatening that “any display of aggression will be met with a determined reaction from Israel. 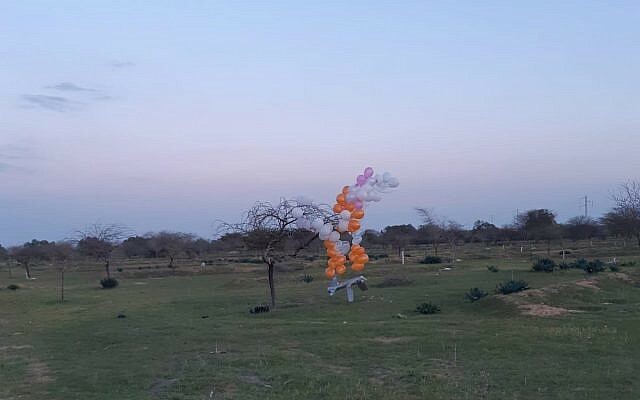 The border region has seen increasingly intense bouts of violence over the last several days, with Israel carrying out airstrikes in response to explosives tied to balloons launched from Gaza. Earlier Thursday, Israeli warplanes bombed a Hamas naval post in Gaza, hours after a mortar shell was fired from the Palestinian enclave at southern Israel. Palestinian media reported that the target was a Hamas naval commando base. A Palestinian security source confirmed a Hamas base was struck, causing damage but no injuries. The Hamas-linked Shehab news site said the site was northwest of Khan Younis. The army said the strike, at about 1:30 a.m. was in response to a projectile fired from the Palestinian enclave and an explosives-laden balloons launched at Israel Wednesday night. Hours earlier the army said that it had fired an Iron Dome air defense missile in response to the incoming mortar shell from the Strip. It was not clear the projectile from Gaza had been intercepted or where it landed. There were no reports of injuries or damage. 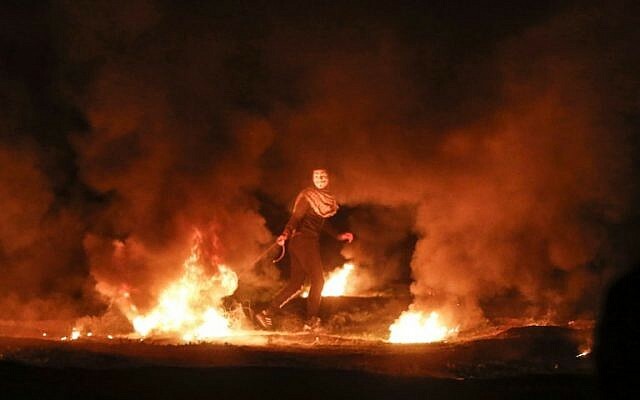 There have also been nightly clashes between Palestinian rioters and troops along the border fence, including on Wednesday night. Gaza’s health ministry said early Thursday that Saif al-Din Abu Zaid, 15, “succumbed to wounds he sustained a few hours ago on the border region east of Gaza City.” Health ministry spokesman Ashraf al-Qudra said he was shot during clashes along the border late Wednesday. Israel has accused Hamas, a terror group that is the de facto ruler in the Strip, of encouraging the riots and using them as cover for more sophisticated attacks. Analysts also believe Hamas may be using the demonstrations to increase pressure on Israel to agree to a new ceasefire deal that includes allowing the transfer of millions of dollars in aid money. An Egyptian delegation traveled to Gaza this week in a bid to convince Hamas leaders to tamp down the violence. They warned that “creating tensions on the border by launching incendiary balloons will bring the IDF to launch a broad military confrontation in the Strip,” according to a report from the Lebanese Al-Akhbar newspaper, which cited a senior Hamas source. On Monday, Hamas leader Ismail Haniyeh accused Israel of breaking a previous ceasefire, which has given way to the renewal of fighting. 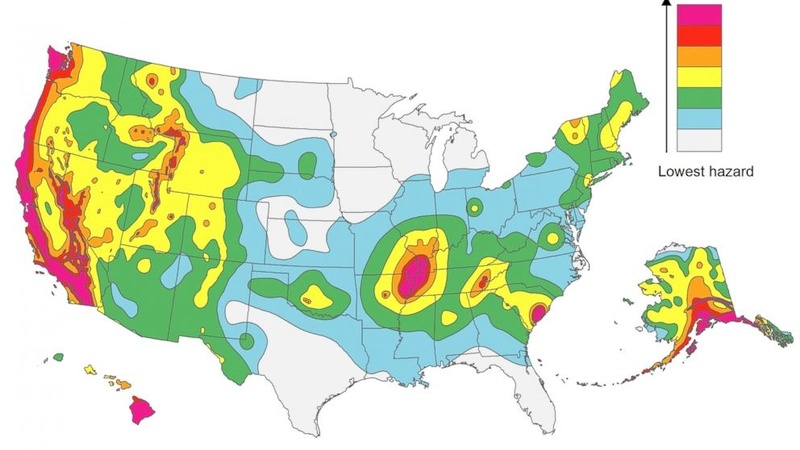 Judah Ari Gross, Adam Rasgon and AFP contributed to this report. Those same sanctions appear intended to threaten Tehran with regime change, put additional pressure on Iran’s 80 million people, drive wedges between us and our European allies and force Iran from the bargaining table. Longer term, they increase U.S. international isolation and reduce the power of the U.S. dollar and Treasury as instruments of world leadership. Sanctions are applied to impel an adversary to seek an agreement on a problem that threatens U.S. interests. U.S.-led sanctions against Iran eight years ago combined with oil price declines and mismanagement of Iran’s economy put its nuclear bomb program under stringent limits and unparalleled monitoring. The result showed an effective use of the sanctions tool. The Trump administration has not spoken of the objectives of its sanctions. Secretary of State Mike Pompeo issued 13 unilateral demands to assure us that Iran will not make a nuclear weapon — a trenchant example of the perfect being the eternal enemy of the good. The president’s vague offer to talk about a “better” nuclear deal by throwing out the existing one is like buying a used car from a convicted carjacker. These sanctions are undermining the well-being of millions of Iranians while egging on Iran to take ever-more aggressive action in Iraq and Syria and build more ballistic missiles. The sole conclusion that Iran can possibly reach is that the United States seeks regime change. The threat of regime change, as Pompeo admitted in Warsaw in a possibly unguarded moment, seems real. Looking only at the history of Afghanistan, Iraq and Libya, the United States has not been very successful. Meanwhile, Iran is launching diplomatic overtures around the world as the state that stands up to the xenophobia of “America First.” Iran’s role today recalls the high point of Fidel Castro’s Cuba, which gained broad recognition as the obstinate David against the U.S. Goliath even though few sympathized with the Cuban system. The abject failure of a recent Pompeo-promoted conference against Iran in Warsaw is a clear indicator that the U.S. strategy of trying (and failing) to build a broad coalition against Iran is undermining U.S. world leadership. Friendly and hostile nations are now planning many ways to work around the U.S. secondary sanctions levied against them to stop trade with Iran. Russia, China and many other nations that have ever more reluctantly used the American dollar as the world reserve currency have expressed greater interest in getting others to use the euro or their rubles or yuan instead. Bankers and government officials assure us that the dollar will remain a great source of American power long into the future. But cracks are developing. Our European allies set up a financial facility specifically to avoid the long arm of U.S. sanctions against their trade with Iran. The Instrument in Support of Trade Exchange will allow goods to be bartered between Iranian companies and others without dollars or international banks. It is unclear whether it will be effective, but it is another signal of mounting rejection of the United States and its Treasury Department. The administration’s determination to restrict Iran’s export of oil to zero is designed to crush Iran’s access to currency and foreign goods. Pushback against these U.S. efforts from states that have traditionally depended on Iranian petroleum has forced the administration to give short-term waivers to eight countries (including China, India and Japan), thereby confusing the world market. For example, the United States has brought significant pressure on Iraq to cease importing refined petroleum products and electricity from Iran. This extra demand on Baghdad has added to the mounting disenchantment of with U.S. confrontational strategies against Iran on Iraqi territory. The U.S. objective should be to undermine Iran’s posture as the victim of U.S. hostility, repair the isolation into which our policies have put us and put on the table a set of ideas for ending Iran’s flirtation with nuclear weapons. There is no major conflict in the Middle East that can be solved without Iran’s involvement, most especially the nuclear question. The paradox of Iran’s mounting influence because of the sanctions is real. The way to solve it is to build a multinational, cooperative diplomatic commitment to convince Iran that constructive engagement beats aggressive estrangement any time. Thomas R. Pickering is former U.S. ambassador to Russia, India, Israel and the U.N., and undersecretary of state. Saif al-din Abu Zeid, 15, was shot in the head by Israeli sniper during Wednesday protest, Gaza health ministry says. A 15-year-old Palestinian boy was killed by Israeli soldiers on Wednesday during an evening protest near the Israeli fence east of the Gaza Strip. Every night since February, young Palestinian men, known as the „night disturbance unit“, have been gathering by the border with Israel as part of the Marches of Return protests, which began in late March last year. At the end of February, United Nations investigators said there is evidence pointing to crimes against humanity by Israeli security forces who shot, injured and killed Palestinians during the massive protests last year. 260 and the injured in excess of 26,000. One Israeli soldier was killed by a Palestinian sniper and four others were injured during the demonstrations, the UN report said. 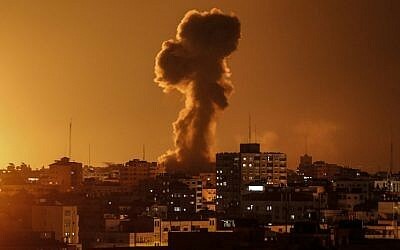 Meanwhile, early on Thursday, Israeli warplanes launched raids in the vicinity of the new port in Khan Younis in the southern Gaza Strip, with no reports of casualties. No injuries were reported, but according to local Palestinian al-Quds Radio, facilities were destroyed and nearby houses were also damaged. The army added that it held Hamas accountable for the cross-border attacks, which it said hit an empty area in southern Israel. No damage or injuries were reported and no one had yet claimed responsibility for firing the rocket.